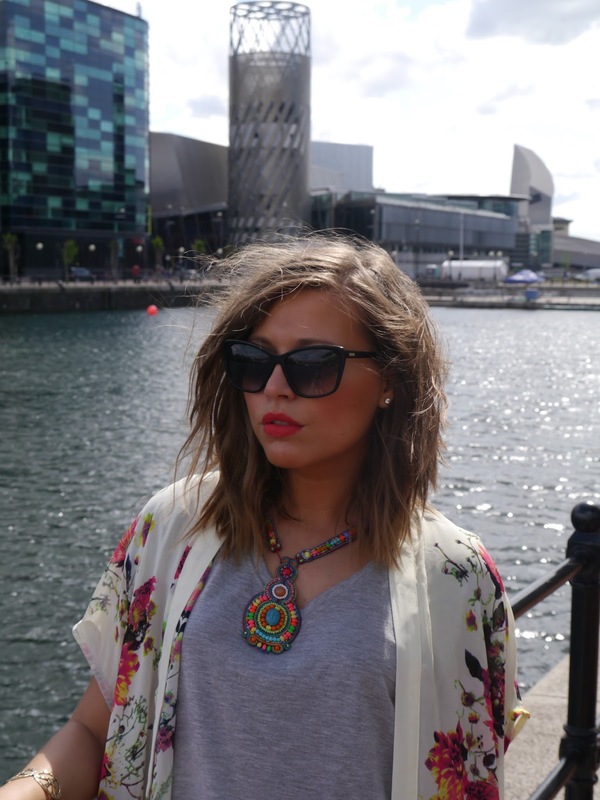 Florals and tassels are a massive trend this season, and this kaftan has combined the two. Whether you go to a festival, having a night out with your friends, or just go for some shopping, it’s that kind of piece that will suits many occasions. I got mine last year in NEW LOOK. You could pair the kimono with this season’s printed slouchy pants, or like in my case wear it with denim shorts – perfect way to rock the fringe kimono – or it can also be easily styled with your favorite pair of skinny jeans. A lot of styles are “affected”by bohemian touch this summer. While boho chicks will undoubtedly be in their element, women with classy style can make their outfit more playful while wearing this beautiful decadent piece. Great outfit! And I you have a wonderful voice, nice, rexaed song. Salford is very beautiful, and you too ! Beautiful kimono, your necklace is absolutely gorgeous! Love those fluffy balls on your bag! !